Dig In are currently gathering apples for our forthcoming Apple Day event, which will be held on the Albany Allotment site, Pasture Road, Stapleford. NG9 8HZ (near the Man of Iron pub). The event will run from 11am to 3pm on Saturday 22nd September 2012 and admission is free. 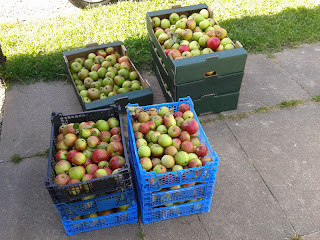 The numerous boxes of apples in the photo were generously donated by Ben Grundy and freshly picked by Dig In volunteers.